During some downtime in the fall of 2000, recovering from a double hernia surgery, I stumbled across Meslilloet Mountain in the Backroads map book. It was marked with a mountaineering symbol. I was intrigued. I spent a week in bed planning the trip, which is all you can do to stay sane during those times when, for whatever reason, you are separated from the mountains. 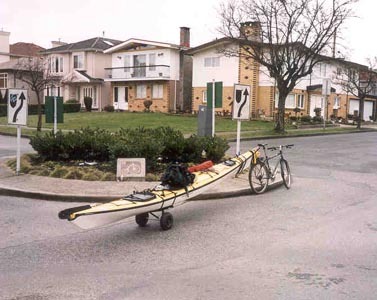 At first my plan was to bike to Deep Cove and rent a canoe which would get me to the head of Indian Arm with my bike. Then I could bike up to the Meslilloet Creek spur road and climb the West Ridge. By the time I was ready to go, canoe rental season was over. That's when the idea that this trip could be done from my house, with the canoe towed behind my bike, came to me. I had done a couple of self-propelled mountaineering trips prior and it always seemed a better way. I got a canoe from Mountain Equipment Co-op and planned a road test to Deep Cove with my friend Jesse. The Road Test: Because of the young and cocky influence that we had on each other, we decided to knock off Felix (designated 'strictly for desperate peak baggers' in Fairly's guide) while we were at it. As usual, we had no idea that it was beyond our one-day time limit. Jesse and I successfully biked to Deep Cove Saturday after work. Jesse biked with a trailer full of gear and I with a canoe behind my bike (full of coffee cups and junk food wrappers from the 'brutal' approach). Apart from a touch of black ice that delivered us off the road and onto a dry curb, getting a canoe and all our gear to Deep Cove was no problem. We laid down our sleeping bags on the beach for the night. We had the misfortune to wake up lower than the high tide line, during high tide, but we chalked it up to a lesson learned. We paddled through a thin layer of ice out of the Cove and three hours later we arrived at the head of Indian Arm. We had brought our bikes with us, in the canoe, to make certain that it was feasible. Not for lack of desperate peak baggers, Felix had to wait for another trip. After spending the rest of the day canoeing and biking back to Vancouver we rewarded ourselves with miso gravy fries at the Naam. Attempt #1: Early January 2001. Jesse and I planned to meet our friends Ivan and Bill, for an attempt on the West Ridge. They would drive to Squamish and then bike south to Meslilloet Creek. We would approach from our previous route. Jesse and I biked to Deep Cove then canoed to the Indian River after work a day earlier than this. We woke up just below the high tide line in the rain. I had a dream that Jesse had brought a waterbed with him, which Jesse woke me up from, telling me that the tent was under water. The problem with learning lessons is usually the duration for which you can retain that lesson. The next day we biked to just below the West Ridge on the Meslilloet Creek spur road. This left us separated from the toe of the West Ridge by Meslilloet Creek and its gully. We camped and waited in vain for Ivan and Bill. Ivan and Bill had met lots of snow and ice below the Stawamus-Indian divide, there they had drank some fine Croatian wine and then decided to head home. We opted for the West Ridge direct instead of continuing around to the north side of the ridge and going up Grants Keyway. We went to bed early and woke up at 5:00am. After six hours of the wettest and most brutal bush whacking (with ice axes to assist against the gradient) we found ourselves well below the alpine and decided that we had no chance of gaining the summit. We turned back and headed back to Vancouver. By the time we got into Vancouver I was sick with a cold and exhausted; I decided to take a direct route through town that had us biking over unnecessary hills. Jesse's logic against, was perfect babble to me. All I could do was head directly for the Naam. Hunger is the finest of seasonings and miso gravy took on a flavour that can not be described. Attempt #2: February 2001. Jesse lied to his good friend Paul Barclay. Something about a weekend hike. All three of us set out to do the South Ridge via Hixon Creek, Norton Lake, and Joseph Lake. One kayak, one canoe and a trailer full of gear. We were turned back three times on the first day by high winds on Indian Arm. The debates about which direction we should be heading (home vs. Meslilloet) were relentless, sometimes with each other sometimes to ourselves. About one third of the way up Indian Arm we had to turn back or camp as it was well past dark and still, white caps threatened at our gunwales. I elected to ask a cabin owner for a good place to camp for the night, hoping that the nearby cove would be fine. I stood at his backdoor, cold and frustrated from a day of travel with not much distance to show for it. When he opened the door a waft of warm air hit my face and at once I noticed the two glasses of wine and the beautiful woman that he was cooking dinner with. That doorway separated our two different worlds. I almost walked in to find out what we were cooking. He was short on words and told me the only place to camp was across the Arm on the North Twin Island. After almost capsizing, we arrived there and camped for the night. We woke up to calm waters and made it to the head just as the wind picked up again. Only by relentlessly asking Paul about his Physics project (and all the necessary Physics to understand it) we managed to hike all day towards Joseph Lake. Along the way we bumped into two beer drinking motorcyclists who boat out to this area in the winter when the logging roads are closed. They had been doing this for a few years and had never seen anybody before. They told us that their wives had noticed us biking on the Dollarton Highway and wondered why they never did anything like that. We hiked up to Norton Lake on a logging road. Then we hiked up an overgrown logging road above Norton Lake to a saddle that brought us to the top of Hixon Creek gorge. We traversed north, finding the odd bit of orange flagging and made it to just below Joseph Lake late that night. Paul's GPS insisted that we were actually in Joseph Lake, but we were clearly right beside the creek. It snowed a wet snow all night and we drank scotch as we watched the tent walls sag. It started to rain as we packed up camp. Silence hovered over camp as we waited to see who would mention turning back first. We arrived at the Naam later that night. Attempt #3: The last weekend of winter. No one was willing to take any more time off work to paddle in the rain with me. So, left with no partners, I planned to leave after work by myself for the South Ridge. Luckily Russ my co-worker had no idea what I was talking about and decided to join me. Some details may have slipped my mind when I was inviting him. We decided to leave the following morning. Two kayaks were filled with all our gear and each of us strapped one to our bikes. I picked Russ up at his house just as it began raining. It rained consistently all day. We arrived at a woodshed at the head of Indian Arm just as the day ended. I was soaked head to toe. As far as I know there is no protection against twelve hours of travel through West Coast weather. I had Gore-Tex covering everything except my boots and my face. We built a fire, ate carrots and drank Jaegmiester and Glen Livet. Day one and already I was feeling those beautiful soothing Naam sensations. A wolf visited us the next morning and he didn't like something that he smelled; he tucked his tail between his legs and headed back up the road towards Squamish. It rained all morning as we biked and hiked to Norton Lake. Just after we left Norton Lake the sun came out! We stopped and took our outer clothes off to enjoy the heat. Shortly after, we headed into the soaking wet bush towards Joseph Lake. The sun ensured that the snow from the trees melted on us all the way to Joseph Lake. We arrived wet and bitter at Joseph Lake with one day left. My thermarest had a hole in it and I spent the night waking up every hour thinking how much warmer it would be if I could manage to tuck the rope under my sleeping bag. I never did. The next day we walked across Joseph Lake and up the South Ridge to the infamous Bump. As we roped up, a couloir to our right avalanched and disappeared down the mountain. I belayed Russ to the gap separating us from the summit ridge. He told me that he wasn't too experienced in these matters but that it just dropped off. I checked it out. I gave the same assessment. I discovered that all my climbing gear was in the tip of my kayak at sea level. All my courage, if I ever had any, was at the bottom of that couloir. The ridge is easy third class in the summer and so it is probably easy climbing in the winter, but not for Russ and I. We turned back and pushed for home. Later that night I biked past the Naam, I was too tired to stop. A Different Mountain: This Summer Matt Gunn drove his friend Colin and me to a point that took us two days in the winter to access. I spent a pleasant day bushwhacking to the bump and on to the summit cairn. From the summit I saw nothing but white. Visibility was zero. It felt right though, that I wasn't allowed a view after such an easy approach. I couldn't justify a visit to the Naam. Matt asked me, on the drive back to Vancouver, if I would recommend the route to my friends. Mat and Colin are not as tolerant of bushwhacking as I am and had turned back at Joseph Lake. I told him I didn't think I could, but I wasn't answering the question he had asked. I was answering the question I thought he was asking 'did I think that he should recommend it to his friends?' Of course I would recommend it to my friends and I am currently looking for partners for winter 2002.